Levens Hall, along with Sizergh Castle, is one of the South Lakes area's most popular tourist attractions, and is world famous for its topiary gardens. From my point of view however, the hall is a fascinating collection of period buildings, based around not one, but probably two fortified towers, one highly visible whilst the second is hidden...incorporated into the core of the structure. Above. View the Levens Hall looking South towards the 16th century tower. Levens was traditionally the seat of the Redman family, who may have been in possession of the estates here at Levens from the 12th century right through to the mid 14th century, when Curwen speculates that the original fortified building was constructed. This original tower, with accompanying hall block and tunnel vaulted basement is now hidden within the confines of the wing to the rear or the East side of the building, shown in the photo below. Above. View of the East side of the hall, possibly incorporating a 14th century tower. I have been on the tour of the interior of the Hall, but this was many years ago, so I unfortunately have no recollection of what was visible in this portion of the building. Next time I visit I'll make sure I check out the architecture here to try and establish what is left of what is rumoured to be the original fortified part of the building. Peter F Ryder in his review of the defensible buildings of South Lakeland seems fairly reticent about Curwen's suggestions about this earlier tower....he does agree with Curwen that the presence of the thick walls here could suggest an early tower, but doesn't fully commit himself. Above. View of the Hall through the gates. 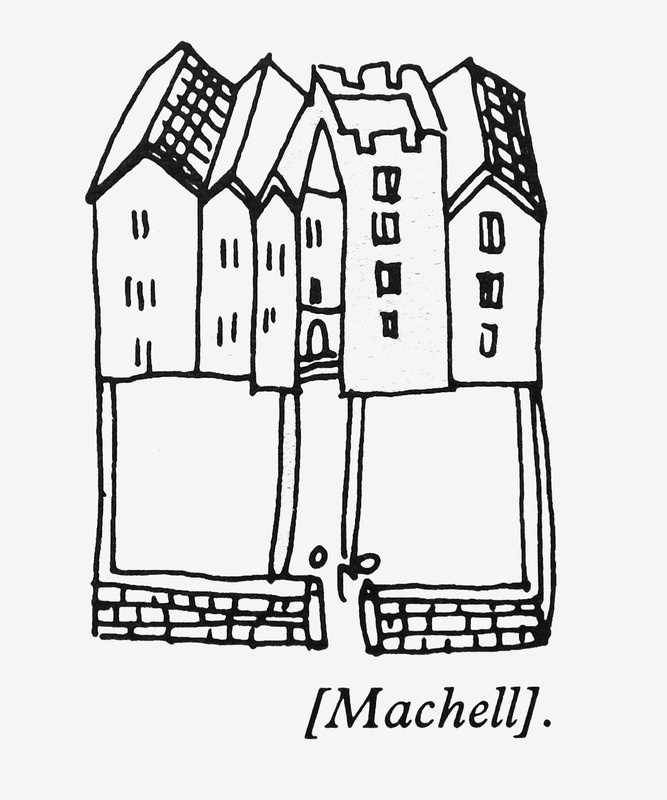 The view above, shows the tower (the second bay from the right) which most likely dates from the 16th century, and is clearly shown in Machel's sketch from his travels during the 17th century. Peter F Ryder has contemplated that the tower may be earlier, possibly basing his assertions on the look of some of the architectural features that can still be seen. Above. Close up of the tower, possibly dating from the mid 16th century. Above. Machell's sketch of the hall as it would have appeared to him in the 17th century. When all is said and done, it's plain to see that Levens is a complex structure, with each succeeding family adding to and changing the fabric of the hall and its attendant buildings. The Bellingham and Grahame families have all had input into the building, and their contributions over the years have only served to enlarge the site and further confuse us. Above. View of the hall from the gardens to the North. Above. Oblique view of the 16th century 'pele' tower. Above. The South side of the Hall. Mike Salter, in his The Castles and Tower Houses of Cumbria surprisingly makes little mention of the hall, and his comments don't really contribute much to the discussion. When the Grahame family took ownership of Levens, in 1688, Colonel James Grahame brought a French gardener Guillaume Beaumont with him. Beaumont was responsible for the design of the gardens in 1694, as well as the long avenue of trees across the River Kent in 1701. The Levens Hall website is well worth checking out.